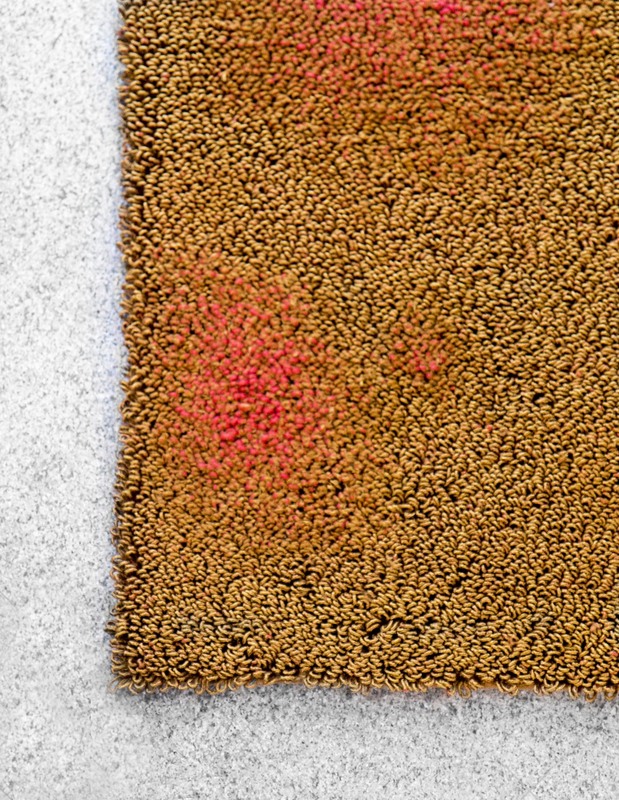 Ripening Rugs represent a positive take on the process of wear. We have designed these rugs so that they come to life through intensive use: as the yarn or weave becomes worn, the rug begins to reveal a different colour, texture, or pattern. Working closely with different companies and professionals, we have developed our own techniques, including yarns with special characteristics. The gradual erosion is what makes these floor coverings increase in attractiveness, each in its own way, rather than rendering them valueless and ending their life as with so many industrially manufactured products. The Hanging Basket chair is woven of strips with different forms that define the shape. This self-developed 3D weaving technique is made of coloured sheetmaterial. The form of each of the 40 strips is different and when woven together they create the 3D shape. Bubbelgraphy is a series of vases with a mesmerising look. The pattern on each product is created by a special process of blowing air bubbles in the glaze. The coating creates a three-dimensional motive and makes each vase unique. Designed in collaboration with Thomas van der Sman. By sandblasting the ECO-oh! board, I gave the ECO-oh board a whole new identity – not by adding material but by removing a tiny part of the board’s surface. By transforming the texture, it reveals an aesthetic feature that evokes aspects of stone and concrete and unfolds its decorative potential for interior design and architecture. From integrating scratch-proof coatings to finishes that facilitate easy cleaning, we do everything in our power to prevent our products from aging by essentially freezing them in time. But why? Adrianus Kundert believes richness comes with age and it’s a phenomenon that can add to a design’s value. Within his work, Kundert chooses to let gradual erosion become part of a product’s lifespan. The follow up to a series of rugs, which revealed different colours, textures and patterns when ‘damaged’ by usage, Transsaddles is an experiment in seating areas. Just like the floor coverings, they change appearance after repeatedly coming into contact with people. From integrating scratch-proof coatings to finishes that facilitate easy cleaning, we do everything in our power to prevent our products from aging by essentially freezing them in time. But why? Adrianus Kundert believes richness comes with age and it’s a phenomenon that can add to a design’s value. Within his work, Kundert chooses to let gradual erosion become part of a product’s lifespan. The follow up to a series of rugs, which revealed different colours, textures and patterns when ‘damaged’ by usage, Trans-saddles is an experiment in seating areas. Just like the floor coverings, they change appearance after repeatedly coming into contact with people. Part of the Envisions, products in process. For this project Adrianus looked into beauty of Indigo when used. Jeans are probably the best example since we even sell them these days in fading colours that are intentionally designed. But also the uniforms of the French officers and English navy where dyed with indigo and got a stunning worn look after years of serving. Young officers would rub their uniforms with a brush to reach the same effect. Kundert has designed this rug so that becomes richer with time, as new shades of blue appear on the area’s that are frequently walked on. In this way he wants to extend the lifespan of the product and put the mortality of materials in a positive spotlight. Indigo is unique compared to other dyes as they dye thorough the yarn. Indigo reacts to oxygen and is basically a thin layer around the yarn, what give textiles a very specific patina. The Indigoes rug makes use of this quality and will show brighter tints when wearing out. Visuals made for Textile View Magazine in collaboration with Envisions and Stijlinstituut. Photography Ronald Smits.